Craig Timm of 4Yacht is back with another far-out concept. The Florida yacht broker – who also brought us the so-called world's biggest superyacht, billion-dollar Triple Deuce – presents us with an almost equally improbable 200 metre superyacht concept named Double Century. But this time, rather than just releasing an outline of a yacht, 4Yacht stepped up their game and partnered with a designer to show some renderings. Whether Double Century has any better chance than Triple Deuce of hitting the water is yet to be seen, but this yacht concept does have some proposed wow-factors that are hard to ignore. 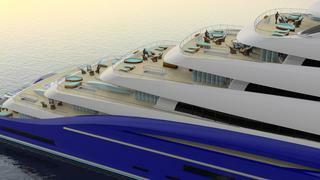 Here are the top four wow-factors of the 200 metre Double Century superyacht concept 1. Dual helipads – and toys galore Little-known designer Christopher Seymour has designed the 200 metre Double Century superyacht concept with not one but two helipads. And a helicopter as large as an EC135 is said to be able to be hosted in the hangar bay below. Beyond this, the yacht would be able to host the typical water toys and some cars and submarines, too. Craig Timm of 4Yacht is back with another far-out concept. The Florida yacht broker – who also brought us the so-called world's biggest superyacht, billion-dollar Triple Deuce – presents us with an almost equally improbable 200 metre superyacht concept named Double Century. But this time, rather than just releasing an outline of a yacht, 4Yacht stepped up their game and partnered with a designer to show some renderings. Whether Double Century has any better chance than Triple Deuce of hitting the water is yet to be seen, but this yacht concept does have some proposed wow-factors that are hard to ignore. 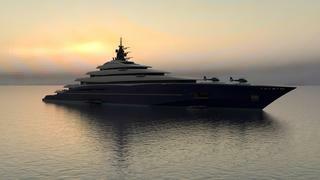 Little-known designer Christopher Seymour has designed the 200 metre Double Century superyacht concept with not one but two helipads. And a helicopter as large as an EC135 is said to be able to be hosted in the hangar bay below. Beyond this, the yacht would be able to host the typical water toys and some cars and submarines, too. The Double Century yacht would be able to carry up to 50 guests, and the design for this massive 200 metre yacht concept proposes that the 50 guests will be accommodated in “deluxe cabins.” The owner’s suite and all of the VIP staterooms on Deck 7 would have their own living areas, his-and-hers bathrooms and 270-degree views. The owner’s suite and all of the VIP staterooms on Deck 7 would have their own living areas, his-and-hers bathrooms and 270-degree views. So just how do you keep 50 guests entertained? With cruise ship-style diversions, of course. According to 4Yacht, the wild Double Century concept will have a 126-seat theatre with an adjacent bar for a drink after enjoying a stage show. Those who don’t feel like partaking could find respite in the 200 metre superyacht's library with a garden. There will also be some classic big luxury yacht features, such as multiple swimming and spa pools, a disco, cinema, beauty and massage parlours, gyms and saunas. The 200 metre Double Century yacht concept is said to have eight elevators that will service her nine decks, which in total rise 27 metres above the sea. For those that think this yacht might be too big, well, 4Yacht assures that she “can be scaled down to 185 metres without losing decks”. And too small? No problem! She can also be scaled up to 225 metres. As the yachting industry well knows, a fancy concept does not a new build contract make. Double Century certainly proposes some interesting wow-factors, but until there is ink dried on a contract, or better yet steel cut in the yard (and a yard named), we’ll continue to honour Azzam as the world’s largest yacht. The 200 metre Double Century yacht concept is said to have eight elevators that will service her nine decks, which in total rise 27 metres above the sea. For those that think this yacht might be too big, well, 4Yacht assures that she “can be scaled down to 185 metres without losing decks”. And too small? No problem! She can also be scaled up to 225 metres. 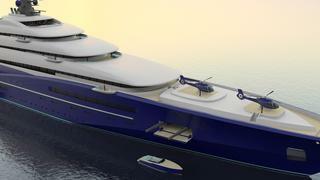 As the yachting industry well knows, a fancy concept does not a new build contract make. Double Century certainly proposes some interesting wow-factors, but until there is ink dried on a contract, or better yet steel cut in the yard (and a yard named), we’ll continue to honour Azzam as the world’s largest yacht. 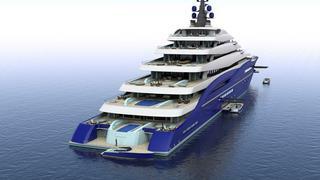 Will billion-dollar Triple Deuce really become world's biggest yacht?